Take Dumbo and Dr. Dolittle and mix the two stories together and you get Water for Elephants by Sara Gruen. The story peels off the page as Jacob Jakowski, now into his nineties, begins to see his young adult life through a nursing home window; where a circus is being constructed across the street. As Jacob daydreams back to his old life, he is reminded of the death of his parents and his life-changing choice to join he circus as the official veterinarian for the Benzini Brothers Most Spectacular Show on Earth. But this story is much more than a boy’s experience of traveling with the circus; it’s a journey of his heart. As Jacob becomes more entangled with the inner workings of the circus, he quickly discovers the darkening secrets that lie beneath the Benzini Brothers. 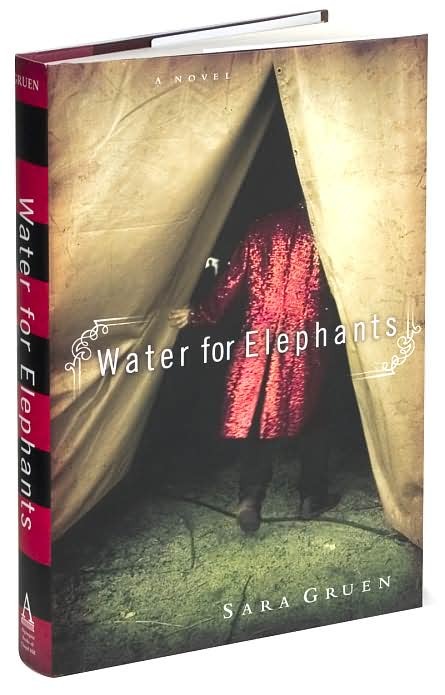 Water for Elephants fills each page with reverting emotions that are often bypassed by other writers. With a twisted love, The Great Depression, a Polish speaking elephant, all portrayed through the misty memory of a old man, Gruen leaves you lost in the 1930s waiting for the next live performance. Step right up ladies and gentleman and experience the deepest expression of passion of all . . .